sweethearts, originally uploaded by *FIFI-LAPIN*. happy thursday! i have a long day ahead of me waiting for the electrician to arrive (who knows when?) and then complete (ha!) the power problem in our garage. wish us luck. it could be a long day without the yard as an option for playtime. and, oh god! what if he needs to cut the power? it's supposed to be about 95 degrees today, no even counting in the humidity. urgh. time to get zen and make my mind over matter-ing happen. something to share today is this image from one of my favorite etsy sellers and bloggers, fifi lapin. 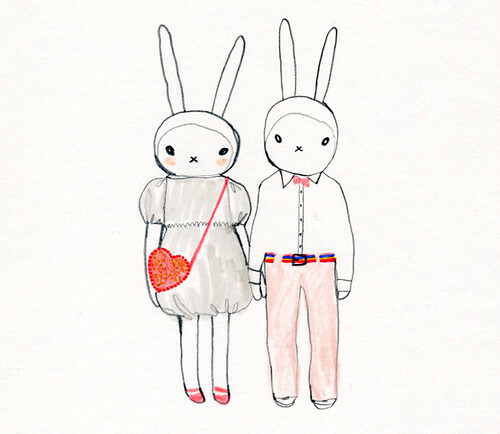 the artist dresses fifi the bunny and her mate sonny adorably in the latest fashion lines. oh, fifi. you're life is to be envied, you sassy little bunny. come be my pet and let's share clothes. more specifically, do not forget the matchy set containing the blue chanel dress with the red cut-outs. that is my dream dress...i swear it is the very dress i have always known was out there, somewhere, waiting just for me. what do you say, fifi? call me.